Description: For those who wish to avoid STDs, or if one is not yet ready to undertake parenthood, abstinence is the only sure answer. The use of condoms has been shown to be of little value for either purpose. 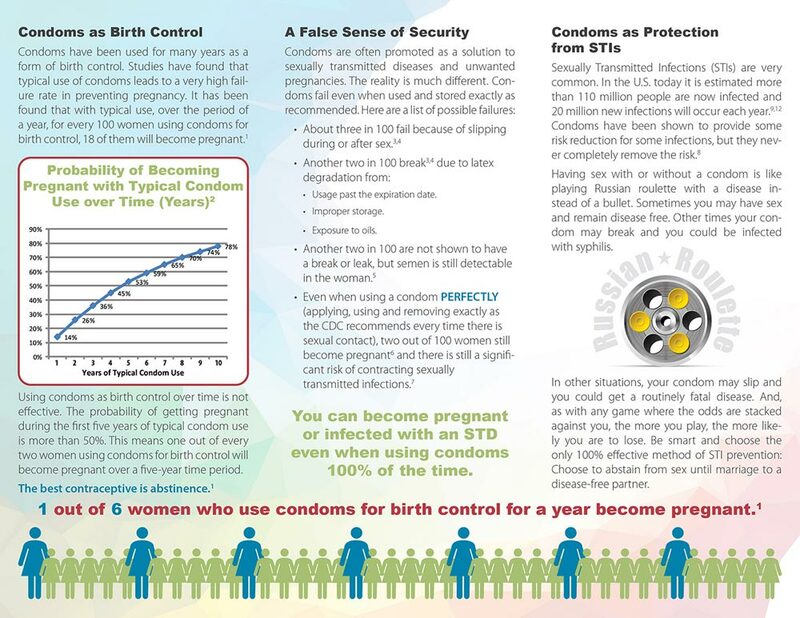 This pamphlet presents a no-holds-barred discussion, fully documented and up-to-date, of the argument against condom use. Concise and easy to read with graphs, charts, and poignant images. This is a strong argument about the real protection provided by condoms. Although many clients wanted to read this one because they thought it was about how to use a condom, I often had to read it with them and stress the unreliability of condoms and abstinence as the only option for absolute protection. This has a lot of great information but for many of our clients it is too verbose. Wish there was a shorter version of it--perhaps a rack card rather than a full brochure. Best stats, love the chart on here. I think the best out there right now. Only thing a little wordy, so many times girls and guys are overwhelmed and put it down. But if you can point out a good point or 2, you got something.